My name is Brandy Brink; I am a woman in Long term recovery. I have struggled with addiction for most of my life. The first time I went to treatment I was 12 years old. I’ve been in and out of recovery more times than I can count. My story is no different than anyone else’s. I grew up in an abusive home and by the age of 12, I was a ward of the state. I spent the next 3 years in and out of foster care and group homes. At 15, I applied for my GED which allowed to move out on my own as an adult. I don’t think it ever served me well to make my own decisions at that young age. I was angry at the world and confused as to whom I was, or where I belonged. Using was my escape, and I was happy to ignore my reality. Over time my addiction continued to progress. Everything I thought I would never do, I did. I’ve spent time in and out of jail, as well as visited the inside of prison walls for a year of my life. I have beautiful children that I lost the privilege of raising. Every rock bottom I somehow managed to lower. I saw no future, no fixing what I had become. There is nothing that happened almost 3 years ago that was particularly different… I was arrested once again, I had lost everything once again, and I wanted to die… like I had always felt. But something changed. Maybe it was because there was nothing left to lose… Maybe because I could no longer escape my reality. Maybe because I finally surrendered, and accepted what had been and what was. All I know is something deep inside of me finally gave, and I was brand new. I can’t tell you the gratitude I have today that the obsession to use has been lifted. Words will never explain how blessed I feel. I owe that inner peace to God. It was a painful process. I had to walk through every emotion I had avoided for the better part of my life. I knew it wasn’t going to be easy. Today I am constantly in awe of my life. Sometimes I laugh at how surreal it is. How blessed and undeserving I am. But I remain grateful and honored to have what I have. In 2016, I was going through treatment (AGAIN! ), and as others learned that I had done property management, I was overwhelmed by the requests to help find housing. I realized how lucky I was, I too have multiple felonies. I was graced in having experience in properties, and I was able to find housing based on that alone. I saw that I would be in the same position had I not built the relationships I had. The “calling” to help others in this way was so strong; it was all I could think about. I knew if I was faced with this same challenge, it would have been much more difficult to grow. I believe when someone is in survival mode, it is impossible to grow. I wanted everyone suffering in the way I knew I was, to have the chance to focus on the healing. I thought if one less obstacle was in front of all recovering people, there was no limit to where they could go. I began meeting with property owners, the city of Mankato, researching, asking questions, and reaching in every direction I could to figure out how to make this work. I was told, “NO!” 90 times to every ‘maybe’. But I believed. I kept going, I kept searching. I learned patience for the first time in my life. I never doubted. I can’t tell you why I believed in this so much, but I did. I trusted God. It took over a year, and so many influential people, and on October 15th, 2017 the Mankato Sober House for women opened its doors. I am so amazed by the women we have served in the past year. I can’t tell you how rewarding it has been and how honored I feel to be a part of their journey. I believe in what we are doing within this organization. We have grown so much in the last 18 months. I am so grateful for all the support to continue to explore all the ways we can be of service. Beyond Brink, was recognized by ARCO as a Recovery Community Organization in September 2018. We have been certified by the Minnesota Certification Board as a Peer Recovery Specialist Academy. WEcovery Academy will be having our first training October 11th, 2018 in Mankato, MN! We have extended our peer support services to our community. We are in the process of opening a men’s sober house, looking at buildings for women and children, and have begun working with several property owners on affordable housing. We are continually reaching, constantly evolving and always trying to bring hope and possibility to those around us. I certainly don’t want anyone to believe I was capable of doing these things on my own… because that is far from the truth. I had many many people who made this possible. Without them none of this would have happened. Jon Kietzer and Tom Larson saw something in me I myself did not know was there. Kayla Forsythe for sharing her knowledge and passion in this. The city of Mankato for taking a chance on this idea. Dan Gustafson, who as an attorney, has gone above and beyond in answering questions at all hours of the day and night. Mischa Ludwig for being ‘God’s Glue’ and Kevin Langton for your guidance. Gary Peterson and Linda Ellanson for your continued support and love, you truly are like parents to me. Darren Reed for coming on board and jumping right in with our continued growth. Kara Richardson and Samantha Gilman for always supporting this organization. My friends who supported not only me but the women we serve (yes, that is you Kyle Rogers’ Brink!). And above all God. I was simply an instrument. I have done nothing more than followed his direction. But it’s been a pretty amazing hike. And to the women we have served. To quote Winnie the Pooh, "You are Braver than you believe, Stronger than you seem, and Smarter than you think.” This was all for you. Our MISSION is to assist individuals seeking to improve their lives through the process of recovery. Our PURPOSE is to empower individuals who desire to maintain long-term recovery by creating avenues to support recovery. Our VISION is to provide tools to promote whole wellness. Please join us to help generate hope, reduce stigma and show our community RECOVERY WORKS! 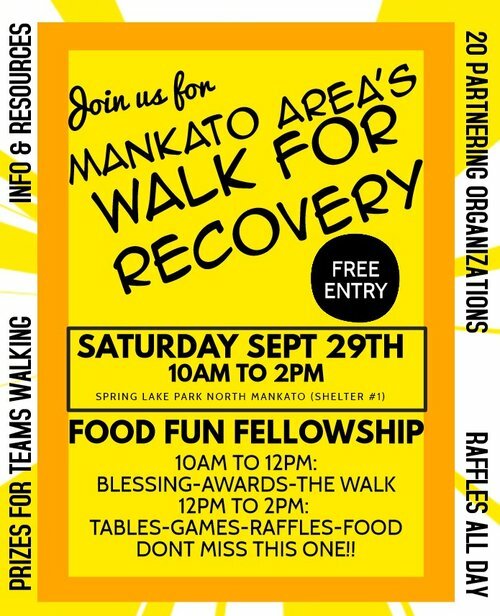 At our first Mankato Area’s Walk for Recovery September 29th from 10am to 2pm. Visit with partnering organizations for information and resources, games, food, prizes, raffles, FUN!!! For information on our upcoming events, Peer Support Services, CPRS Training Academy, Sober Housing, Affordable Housing, Volunteer Opportunities, or ways to donate visit www.beyondbrink.com. Thank you so much for taking the time to learn about me and all of us at Beyond Brink and WEcovery! Thank you for all you do in the recovery community and all you have done for me! You will never know how deep my gratitude is to know you.